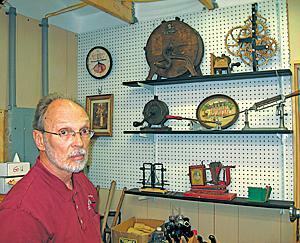 Bottorff's workshop is cluttered with tools. 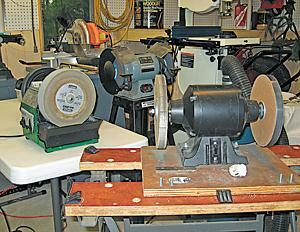 sharpeners, and paper sharpening wheels. on the shelf, top center in the photo. the full size Blankner (the red one). I am 68. Knife World is in Knoxville. them third after knives and scissors. the Ohio City neighborhood of Cleveland. Steve Bottorff may not be a young blade, but he is still a sharp cookie. The South Euclid resident, 69, not only turned a knife sharpening hobby into a second career, but he helps keep the craft alive. Bottorff's first introduction to knife sharpening came when he got a pocket knife as a Boy Scout. He soon learned that his grandfather was known as the best knife sharpener around. "He was a country doctor, and he had to sharpen his own scalpels. 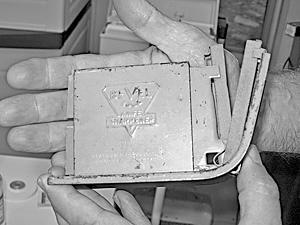 He developed the knack for getting a sharp edge," Bottorff said. "He taught me a few things, but he said I wasn't very good." As an adult, he always looked for gadgets that claimed to make sharpening easy, but nothing ever lived up to the claims. Then, about 15 years ago, he came across a book that helped him hone his craft. When he retired from Keithley Instruments, he decided to write an article about what he had learned through the years. It was accepted for publishing in Knife World in Nashville. Then the publisher asked Bottorff to write a book on sharpening. He agreed, and the first edition of "Sharpening Made Easy" was published in 2002, then a second in 2006. He set up a website to promote his book. That led to more phone calls from people asking him to sharpen their knives, or to teach them how to do it themselves. "I show about a dozen ways of sharpening knives to people, then let then choose what they like best," he said. Now from May through October he spends about 10 days a month teaching, and about eight days a month sharpening knives at North Union Farmer Market at Shaker Square, Crocker Park and around the county. "The person before me at the farmers market was an Amish man who sharpened a lot of gardening tools. So I learned to do that, and that has become a secondary specialty," he said. In winter, he works a couple of days a month at culinary stores, where chefs bring him their knives, and in his back yard workshop. "One couple traveled full-time in their RV. They were coming through town and tracked down where I was," he said. One of his favorite clients is the Inter-Museum Conservatory Association in Detroit, where he sharpens a variety of small scissors, knives and tweezers used to pull apart pages of manuscripts or pick fibers from paper. He also finds his work offers him a slice of American Life. He speaks to groups from piano tuners and an experimental aircraft group to Chagrin Valley salmon fishermen. "It is always something new," he said. © 2007 cleveland.com All Rights Reserved.